Do you want to get rid of winter blahs? If you want then it is time to update your home with spring home decoration. A new season invites a lot of changes to your home. Ladies, spring season is right around the corner. It is the time of renewal, beautiful flowers and fresh bright colors. You must decorate your home with beautiful bright colors. Spring is a welcome time for changes after cold winter and spring home decoration just needs a few changes in your home. Spring décor ideas bring a spirit of fresh air, add sense of openness and nature to cheer your home. Spring calls for beautiful delicate colors in your home. Home is your heaven, the most beautiful place, your sacred land and sanctuary where you relax after a long tiring day. So your home must have freshness and liveliness that you can bring through different means peculiar of spring such as flowers, fragrance and colors. Housewives always want to beautify their home and for this purpose they often make changes in different portions of home. The options for decorating your home in spring are endless. For all of you who love home and want to decorate your home with spring refreshing colors, there are some spring décor ideas. The colors that are light and airy are more suggestive in spring. You can freshen up your home with a new coat of color. Pure white walls give a fresh look. White color looks perfect with all colors. If you do not want white color then you can use different shades of your choice that coordinate with the existing paint on walls. Spring comes after winter so this is time of the year to change the heavy winter bedspread. Replace your bedding. You must change heavy bedspread to something lighter. Green color reflects spring so keep some plants and natural flowers in your home to add more life and excitement in life. Get ready for the sight of beautiful flowers of spring. Put some wild flowers, daisies and dandelions in pastel color vases. 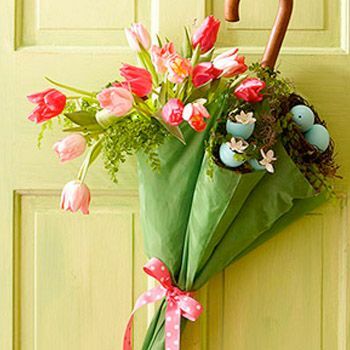 You can make a gorgeous and beautiful basket of potted flowering plants. Flowers and their aroma remind us that spring is in air. You can decorate your house’s corners with glass jars filled with peeps, jelly beans and shells. You can put bright color vases on your side tables. You must go for natural fabrics and texture on your rugs and sofa to bring a sense of nature to your home. You can also go with beautiful color wallpapers in your rooms. Decoration with floral fabrics is a great spring home decoration tip to add life to your room. You can go with so many cushions of shades of your favorite colors huddle together on a single sofa add a relax feeling to you. You can decorate your table with few spring flowers, pieces of fruits and decoration pieces. You can change fabric of dinning chair, lamp shades and sofa. Replace your window mirrors which have dark color and heavy texture with light and soft colors. Let sunlight and fresh air come in your home through your windows. Welcome spring with a good mood! Moon Apparel Fall 2012 LookBook…And Online Shopping!